This morning, while I was getting lunch ready, and putting together the last few details for C's party, I kept the younger girls busy, with a simple, pre-party craft, and story. I covered the table with butcher's paper, taped down at the edges, and drew round, ladybugs on with a sharpie, for the girls to color in. I hadn't been able to find the right color, disposable, table cloth at the grocery store, and didn't want to make a separate trek to the party supply store, so the butcher paper, color-your-own tablecloth seemed like an easy solution. The girls enjoyed it so much though, and the end result was such a nice addition to the party decor, I'm pretty sure we'll be doing this one at more of our parties in the future. 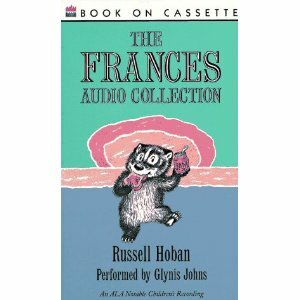 While they colored, and I blew up balloons, we listed to Russell Hoban's A Birthday for Francis, from "The Francis Audio Collection" performed by Glynis Johns (I love the way she says "plush pig" and "Chompo Bar"). It's a good story to play for children, who are not the birthday girl, as a reminder of how to let someone else be special for a day. It's also set in a gentler, old fashioned kind of time (Frances' allowance is only a nickel, and two pennies, and with two allowances, she manages to buy her sister a Chompo Bar, and four gumballs! ), making it a perfect lead in to a homespun, family party, like what we had planned today. And, it was a nice match for our craft, as it begins with Frances, her mother, and her little sister, Gloria, working together, coloring place cards for Gloria's birthday party. You can find more story themed arts, and crafts for children at this week's stART (story+ART) link-up, at A Mommy's Adventures. Sounds wonderful! We are big fans of the Francis books, but we have never listened to the audio versions. We have done the tablecloth coloring, and it is always a big hit. We also like to buy the plain white paper placemats for coloring.